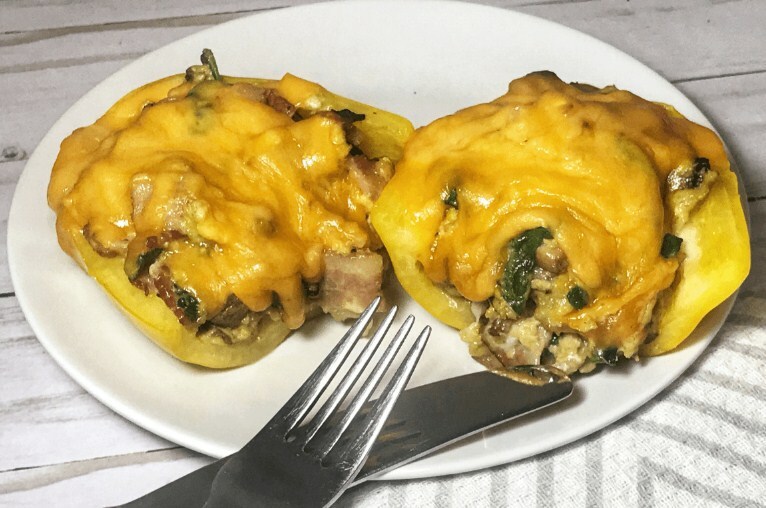 These keto stuffed peppers make the best ketogenic breakfast! Start by preheating your oven to 350 degrees and warm a frying pan on your stovetop using medium heat. While the pan is warming you can chop your mushrooms and your bacon to your desired size. I don't chop them too fine because I like a little bit bigger chunks, but you can definitely cut them however you'd like! Place your bacon and mushrooms into the frying pan and cook on the stovetop until the bacon has started to crisp. The mushrooms will have shrunk considerably as well. While the bacon and mushrooms are cooking, use a bowl to whisk your eggs, but don't add them to the pan just yet. Remember we have to wait until the bacon has started to crisp. At this time, measure out your spinach and favorite cheese. I recommend cheddar, but hey, you do you! Once the bacon has started to crisp it is now time to add your eggs to the frying pan. I put the eggs and spinach in at the same time and let everything mix together, just like a scramble. While that is cooking cut the top off your bell pepper and then place the pepper on its side. Slice the pepper in half horizontally, starting from the opened top all the way to the bottom and place in a casserole dish or on a baking sheet. Now that your scramble is cooked to your liking, you're now ready to stuff the peppers. You should have enough to fill each half perfectly. Once stuffed sprinkle your cheese on top. Place your peppers in the oven and let them bake for approximately 10 minutes on 350 degrees. This will allow the cheese to melt perfectly and the peppers will soften, but will still remain just firm and crunchy enough that you can pick them up to eat. These stuffed peppers are great to pick up and eat, no utensils required. Just a helpful tip, you will want to eat over a plate as bacon grease may drip and stuffing may fall a little as you eat. Just wanted to tell you because I spilled on myself the first time I ate these lol.